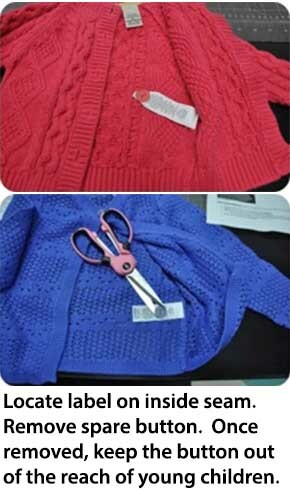 You may have purchased or received the Infants', Toddlers' or Little Girls' Fisherman's or Open Stitch Cardigan Sweater sold by L.L.Bean under Product ID numbers 283148, 283149, 284855 and 286158. In cooperation with the US Consumer Product Safety Commission, L.L.Bean is recalling the sweaters because the spare button attached to the label on the inside seam did not pass attachment strength testing and is considered a choking hazard. Please stop using the sweater immediately until the button is removed. Once removed, please keep the button out of the reach of young children. Please check the side seam for the spare button sewn onto the white label and remove the button from the label. Also note that sweaters in Girls' sizes (8 and up) are not subject to this product safety recall. If you purchased this product as a gift, please pass on this information or call us at 800-555-9717, and we would be glad to send this letter to the gift recipient. All of us at L.L.Bean are firmly committed to providing our customers with the best products and service, and your safety is most important to us. We regret any inconvenience this safety recall has caused. Please contact us at 800-555-9717 if you have any questions or concerns. Our product specialists are available every day from 8 a.m. to 10 p.m., including holidays.